Please, refer to the updated version: Developer guide: Building a SAMSON Element on Mac OS. This tutorial shows how to build SAMSON Elements on Mac OS using XCode. If you want to use QtCreator as the main IDE for developing SAMSON Elements you can follow the same steps and check the tutorial Building SAMSON Element on Linux. XCode; QtCreator (should be available when you install Qt) if you want to modify Qt forms. Open a terminal, go to the folder where your SAMSON Element is stored, open the build folder (if there is no such folder, create it). Execute the following command in the terminal: cmake -DSAMSON_SDK_PATH="YourSDKPath/SDK/0.7.0/" -G"Xcode" -DQT5_CMAKE_INCLUDE_DIR="YourQtPath/5.9.3/5.9.3/clang_64/lib/cmake" ..
A XCode project .xcodeproj file should be generated. You may need to add files to (or remove files from) your new SAMSON Element (e.g. to add or remove classes, to wrap existing code, etc.). When you do so, you should run cmake again to regenerate a project for your development environment. One simple way to do this without having to open a command window is to slightly alter the CMakeLists.txt file located in the SEMyElement (e.g. add a whitespace somewhere) and save it: when building the project (see the next section), CMake will detect the change and update the project. To switch between Debug and Release builds, click on the Edit scheme (see image below) and in the Run tab set the Build configuration to Debug or Release. To be able to use your SAMSON Element, it should be installed in a specific SAMSON directory to make it available in your SAMSON installation. 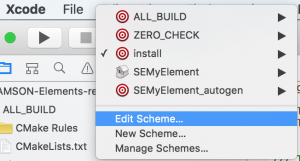 Choose and build the install target (either in Debug or Release configurations) to install your new SAMSON Element (building the install target will automatically build your project). If the build was successful your SAMSON Element should be available when you launch SAMSON (for Release configuration – SAMSON-Core from SAMSON installation, for Debug configuration – SAMSON-Core from the SAMSON SDK installation). During startup, your SAMSON Element will be loaded alongside with the SAMSON Elements you added from SAMSON Connect, as well as other SAMSON Elements you developed. Note that you should start the SAMSON configuration that corresponds to the configuration used to build your SAMSON Elements: a SAMSON Element compiled in Release mode will be available only when launching the SAMSON-Core executable provided with SAMSON installation, while a SAMSON Element compiled in Debug mode will be available only when launching the SAMSON-Core executable provided with SAMSON SDK installation. SAMSON Users only get the Release configuration, since this is the optimized one. The SAMSON SDK installer, though, adds a Debug version of the SAMSON-Core executable. It is this version that should be started when testing or debugging SAMSON Elements compiled in the Debug configuration. For Debug configuration indicate the SAMSON-Core executable from the SAMSON SDK installation and tick the Debug executable checkbox. For Release configuration indicate the SAMSON-Core executable from SAMSON installation and untick the Debug executable checkbox. DYLD_FRAMEWORK_PATH filled with absolute path coresponding to the location of Qt frameworks: YourQtPath/Qt5.9.3/5.9.3/clang_64/lib/. You may also add some command line arguments into Arguments Passed On Launch, like: –logconsole –disablenetwork –import –logfile “file” –logdefaultfile. Now when you build the install target SAMSON will start. You can debug your code in Debug mode, add breakpoints and inspect variables values.